My wheat/rye loaf got a red ribbon, my white loaf got a blue ribbon, and my (Bob Flavored) rosemary onion bagels got both a blue ribbon and Reserve Grand Champion. Not bad for my first year. 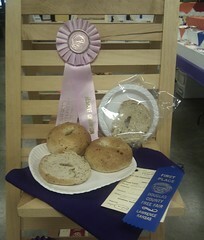 I am now officially an award winning baker, and they are officially award winning bagels. Bob is an award winning flavor (heh). I should probably mention that Pari got blue ribbons for her two dresses, two quilts, challah loaf and recycled material pillow. One of the quilts was also reserve class champion, and the challah was class champion for 7-8 year olds. That's fantastic! And the first outing, too! Thanks for the rosemary onion combo. I chose it because it's a good flavor combination, the smell is incredible, and there are no toppings that will get soggy in the plastic bag. My everything bagels may be legendary, but the toppings are kinda soft and unappealing after several hours in plastic. I wonder what flavor I should do for next year. Maybe lemon ginger. Did I, or did I not say your bagels would win? Congratulations! We knew you were likely to take a ribbon after your extensive experience paid off at the Farmer's Market. Way to go!